Microencapsulation is being used to deliver everything from improved nutrition to unique consumer sensory experiences. It’s rapidly becoming one of the most important opportunities for expanding brand potential. Microencapsulation in the Food Industry: A Practical Implementation Guide is written for those who see the potential benefit of using microencapsulation but need practical insight into using the technology. 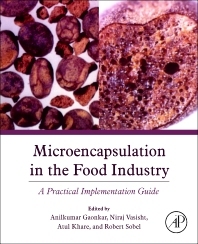 With coverage of the process technologies, materials, testing, regulatory and even economic insights, this book presents the key considerations for putting microencapsulation to work. Application examples as well as online access to published and issued patents provide information on freedom to operate, building an intellectual property portfolio, and leveraging ability into potential in licensing patents to create produce pipeline. This book bridges the gap between fundamental research and application by combining the knowledge of new and novel processing techniques, materials and selection, regulatory concerns, testing and evaluation of materials, and application-specific uses of microencapsulation. 25.8 How can loading and release be controlled? 34.6 Microencapsulated flavors—when to use them? 34.8 Where is microencapsulated flavor applied in chewing gum applications?